Proverbs and Ecclesiastes: Teachings for Today? While reading Proverbs and Ecclesiastes, I couldn’t help b ut notice how a lot of what was written could be applied to today. It almost seems as though many of the teachings, especially in Proverbs, could be applied to today’s culture and is actually relevant. For example, I couldn’t help but stop and re-read one particular section of Proverbs. In Proverbs 6:8-11 it says “How long will you lie there, lazybones; When will you wake from your sleep? A bit more sleep, a bit more slumber, A bit more hugging yourself in bed, And poverty will come calling upon you, And want, like a man with a shield”. At first I just laughed at the fact that the author used “lazybones”. Then I started thinking about how most of us, being college students, do enjoy sleeping so much. But as the Proverbs say, if we lay in bed all day we won’t get anything done, eventually destroying our education, or if we already had a career, our jobs as well. When we’re unproductive, it can be very hurtful to our educations or jobs. I found that interesting that these teachings really can be applied to our lives today. Also, the feel of these books was much different from reading, say, Psalms. I found Proverbs to be more teachings than poems, which they are. I found them a lot more easy to understand and not so prone to metaphors and multiple interpretations. We can still interpret Proverbs and Ecclesiastes in multiple ways, I just feel that the teachings of these books or more straight to the point and broadly stated. As for Ecclesiastes, the book at times was a bit hard to understand. The author, Koheleth, mainly brought up points of wisdom throughout his life and how material possessions are not everything. He gave them all up to live a life of wisdom and find out why things happen. He tries to explain the horrible occurrences that happen throughout life. He never gives a specific reason, he just more or less states things in broad terms, allowing them to be interpreted differently. The theme of this book, to me, seems like “eat, drink, and be merry” because the author states “Go, eat your bread in gladness, and drink your wine in joy” (Ecclesiastes 9:7). He says that life doesn’t last long and we never know the future that is heading towards us, so enjoy life today while you can because tomorrow is unpredictable. The author wants us to still live by God’s teachings but he also wants us to live life to the fullest. We should still be generous to others, like when he says “Distribute portions to seven or even to eight, for you cannot know what misfortune may occur on earth” (Eccl. 11-2). He wants us to still be good people to those who need it and we better do it now because we don’t know what will happen tomorrow. Koheleth also tried to get the point across that we should still live by God’s laws by stating some spiritual advice at the beginning of chapter 5. He starts out by saying “Keep your mouth from being rash, and let not your throat be quick to bring forth speech before God” (5:1). He wants us to watch what we say and always have God in our minds guiding and influencing our actions. Although Proverbs and Ecclesiastes are not very alike, there are still some similarities between them. They both are mainly books about teachings, teachings that are supposed to help us and guide us on how to act in life. Proverbs seems to have more specific directions and Ecclesiastes seems to have a more broad, not-so-strict sort of view or feeling towards it. They both was their audiences to still keep God in mind, but Ecclesiastes also wants its audience to enjoy life and live it to the fullest. Although they are different, they want their audience to live by God’s laws and worship Him. 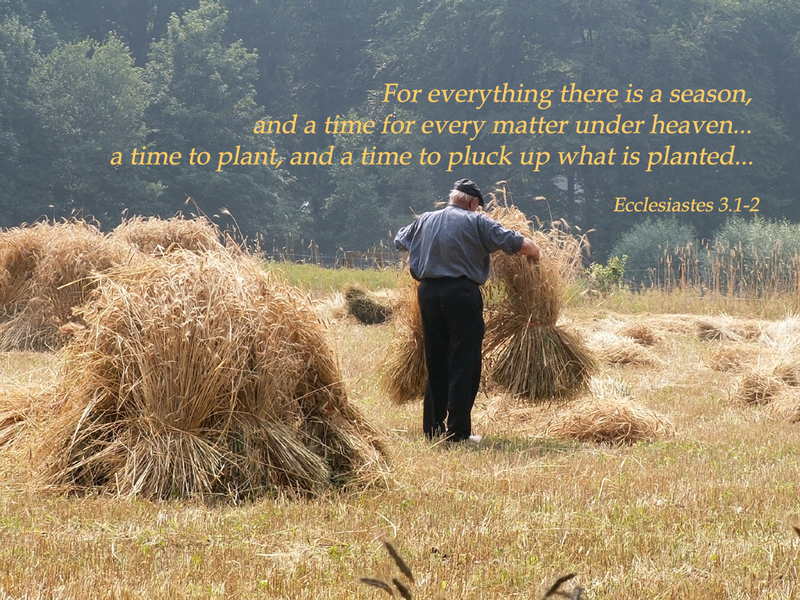 Ecclesiastes is often used or quoted in times of suffering and hardship, I think because it has the most hopeful and useful quotes that help people deal with the trials and tribulations going on in their lives. Chapter 3:1-8 is, in my opinion, the most popular section of this book. I’ve heard it in multiple settings, one being in the movie Footloose and the other is that it is read a lot during funerals. It’s more famous lines are “A time for being born and a time for dying, A time for planting and a time for uprooting the planted; A time for slaying and a time for healing, A time for tearing down and a time for building up; A time for weeping and a time for laughing, A time for wailing and a time for dancing…” (5:2-4). Most of us have heard that section before, and its mostly during funerals where you really sit and think about these things. Hardships affect everyone at some point in our lives and we learn to live with it, although it’s extremely difficult. Most people cannot see the positive aspects or reasons for these occurences, and I think Ecclesiastes tries to shed some light on that painful topic. It states that “”For there is a time for every experience, including the doom; for a man’s calamity overwhelms him” (8:6). Even though it’s not fun or enjoyable, tough times are a part of life, as all of us know. It’s an experience, although painful, that we have to go through to know that we’re living life and caring for others. If bad situations didn’t happen, then we might not be caring enough about our life. Caring and being sad lets us know that we’re involved in things and really care about them. Ecclesiastes also states that “sometimes a good man perishes in spite of his goodness, and sometimes a wicked one endures in spite of his wickedness” (7:15). His response to this situation is to “don’t overdo goodness and don’t act the wise man to excess, or you may be dumbfounded. Don’t overdo wickedness and don’t be a fool. or you may die before your time” (7:16-17). He’s basically telling us to live in moderation. Don’t do anything too extreme because it could cause unpleasant consequences. Life doesn’t always turn out how we want it to, and I think that this book tries to shed some light during those tough times and give people some hope. The reason Ecclesiastes can give people hope is because of the language it uses. There are many verses in this book that make people stop and wonder or think about what they just read. I think that this is one of the reasons it can be listed under the genre of Wisdom Literature. One of the verses I found pretty intriguing was “A worker’s sleep is sweet, whether he has much or little to eat; but the rich man’s abundance doesn’t let him sleep” (5:11). I find it interesting because he’s right: a worker gets to sleep well because he works hard all day, so at night he’s tired and ready for sleep. But the man with all the possessions doesn’t work, so he won’t be tired enough to sleep. All the possessions in the world can’t really help him get a good nights sleep. I think that this verse can be portrayed in other ways as well, like if we are just given things in life, we won’t appreciate them or maybe not even about to enjoy them. But if we work hard and earn the things we have, our life will probably be more fulfilled. It’s the verses like those throughout the book that make people stop and ponder about what they may relate to in our lives today. They’re full of wisdom, encouragement, and guidance and I think that’s why this book is so relevant to today.